Notice the eggs to this seller's right? These are newly hatched Khmer delicacies (post-Khmer Rouge) sold only on the streets by a man pushing a barbecue cart, blasting a recording: "Eggs, they're good for you and yummy too". A small hole is cut into the shell and the egg is sucked out, mixed with lots of spices, stuffed back in, skewered and barbecued. I've seen it done, it actually works. I don't personally like the taste of these things, though I am a big fan of eggs. 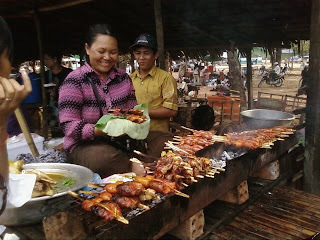 This couple has a barbecue stand, along with all the other barbecue stands selling all manner of meat. She is wrapping up my lunch purchase (chicken) in a lotus leaf. 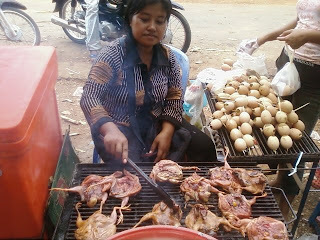 The ones roasting nearest is a stuffed frog-- ground pork or beef mixed with onions and serious spices. 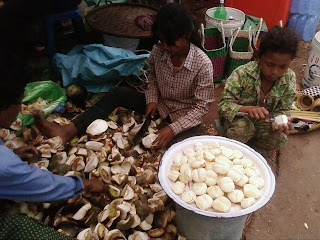 This family sells palm fruit at the market at Phnom Oudong. They're the transluscent square or oval shaped pieces of fruit in the glass fruit cocktail jars at Asian markets in the US. Filipinos love these in their fruit salads. I'll get a close-up next time. More photos in a later post (I will steal my husband's pro shots and post them here hehehe). I'm getting sleepy.